After a bit of a break from sewing and blogging, a holiday and a house move (hence the absence), I'm back and I have a brand new sewing space (*cough* corner). I felt almost out of my comfort zone starting a new project in a different space. 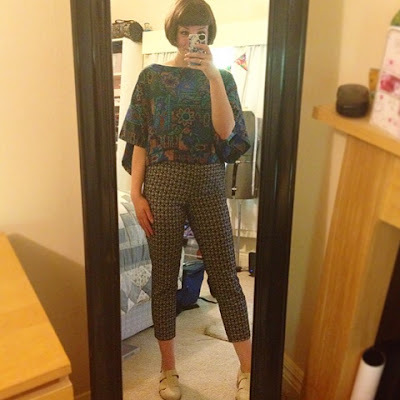 Coincidentally, I chose a to make a garment in a style that's also out of my comfort zone - the Sea Change Top by Lily Sage and Co. I usually steer well clear of unfitted tops, at the risk of looking like I'm wearing a tent. What swung it for me was seeing Helen from Grosgrain Green blog her amazing version of the Sea Change Top. The image on the PDF pattern shows in made up in stripes - I also steer clear of horizontal stripes (who'd have thought it?) - but I loved the abstract print that Helen had chosen for hers. 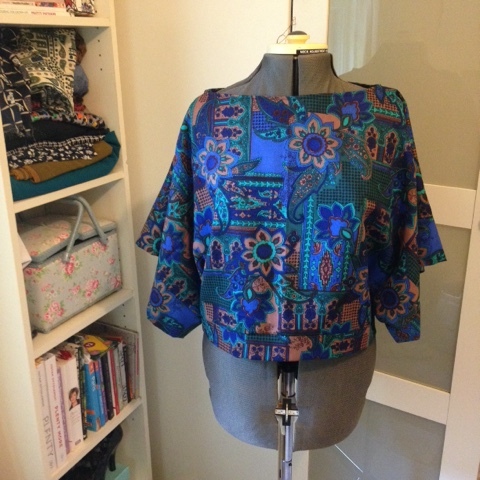 It helped me to re-imagine the pattern made up in the sort of fabric that I'd use, so I bought it straight away. I'm not the biggest fan of sticking PDF patterns together, but this one was fairly simple. 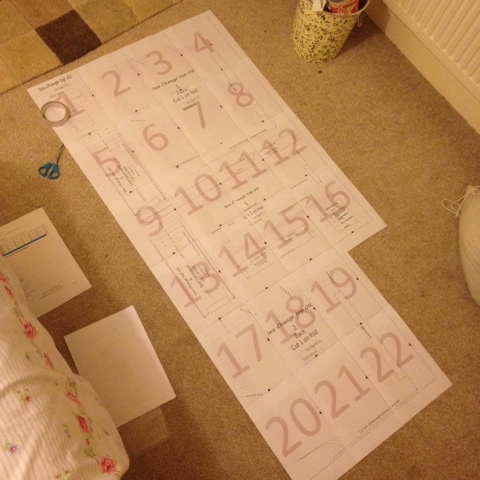 An added bonus is that none of the pattern pieces overlap, so no need for tracing after. I cut a straight size medium - the top is really loose, with no darts or fastenings, so I think I could go down a size if I wanted a slightly closer fit. There's also the option to lengthen the top, but I was happy to go with the standard version which is slightly cropped. A few alternative instructions and pattern pieces are offered if you want to make it in knit fabric rather than woven, which is also handy. 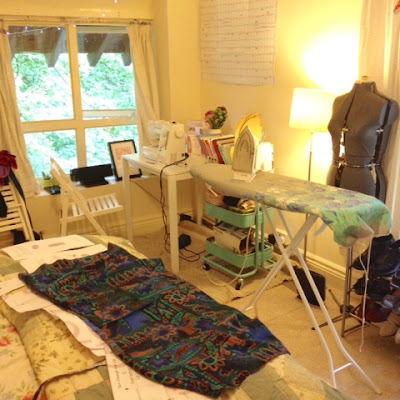 It was so fast to make up, with easy to follow instructions - from cutting out the fabric to finished garment would probably take no longer than a morning. All I can say is be sure to stay stitch your neckline as the pattern advises. I'm so glad I listened for once as mine would've definitely warped out of shape with all the turning in and out before attaching the neck band and concealing all those raw edges. 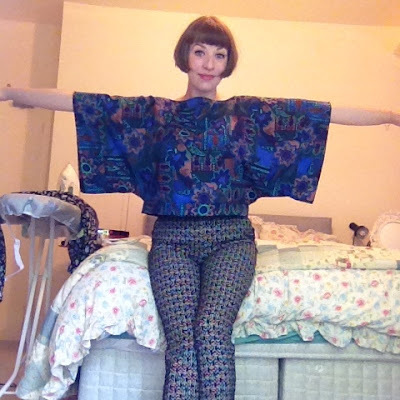 The billowing kimono sleeves mean that the top uses a fair bit of fabric, but I'm lucky to have a shelf full of spoils to choose from after a fruitful trip to the last Hebden Bridge WI Market - more of which I'll be posting about soon enough. 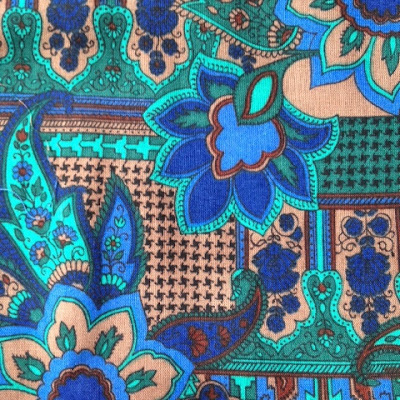 I used this beautiful patterned lightweight cotton. It took a bit of getting used to wearing such a different style, but I really love how it hangs. I wore it to work on the hottest day of the year in the UK, and it was really light and comfortable. As a word of warning though... I managed to swoop up and knock over a bottle of beer (after work) with the kimono sleeves, so be careful if you're not used to them! I'm hoping to try out another Lily Sage and Co pattern - the lovely and quite unusual Wonderland Skirt - over the summer, so hopefully they'll both get a fair bit of wear! I am about to try this today in a black ponte for fall. Thank you for the review!